February 26, 2012 by Alphageek in "alphageek", "discovery"
The other day, the alphageek was asked about wine. If there is anything the alphageek is not knowledgeable about, it has to be wine. The alphageek is more of a beer and bourbon guy. See that different color on the word bourbon? That means you can click on the link, and see the alphageek's bourbon site. Getting back to wine, you might have noticed that there is a picture of a wine bottle above the words here. This is one of the few wines that the alphageek knows anything about, and even that knowledge is pretty limited. The wine above is a Beaujolais Nouveau. There are only a couple of things that I know about this wine. One is that it is a red wine that seems to come out yearly, starting sometime in November. It is a very mild red wine, which means Mrs. alphageek my sometimes drink it as well. More correctly, she looks forward to getting some each year, and enjoying it for several months after November. We did find out that this is a wine that is supposed to be enjoyed fresh. If one waits too long to enjoy the wine, it "turns" (tastes bad) in a matter of a few months. Yes, we once found out the hard way. 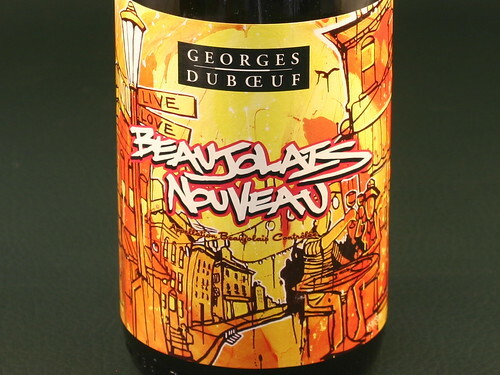 If you want to know more about this wine, other than the alphageek likes it, do a google search on Beaujolais Nouveau. We are not going to just copy some stuff from some other site here, and claim the work as our own. The one thing you might want to know right now is that you will need to wait until next November to try this wine because most stores are now out of stock for the 2011 year.